If you're ready for a life and career adventure - of the first order! - then start considering work on a yacht. Read about the adventures of first mate and captain in training Brandon Harvey, who talks about his career with Maple Leaf Adventures. Can you picture yourself doing this too? What made you want to work on a yacht? After working for larger tour companies, I wanted to experience exploring marine environments with small select groups of passengers. When I was investigating working for Maple Leaf the attraction was exploring the wildest parts of the BC and Alaskan coast on a beautiful classic sailing vessel with guests who have specifically searched out that type of experience. The trips Maple Leaf run include traditional yachting aspects, like maintaining a high level of service, but ultimately we are about exploring and experiencing the wonders of each destination with an intimate group of guests and crew. From the beginning, it was clear the Maple Leaf family is as much about adventure, fun, and friendship as it is about pride in the vessel and the hospitality of the guests they host. Maple Leaf was also attractive as an employer because they have made the environment and conservation a top priority in the way they conduct their business. Which yacht do you work on? Is the yacht a US Ship? Do you have a preference? She is registered in Canada, but works in Alaska for part of the season. She is one of a kind, so my preference is irrelevant. Five, the captain, mate, deckhand, chef, and the naturalist. Onboard I am currently a mate as I learn the boat and its systems and operations. I am training to be captain. I am also the operations manager in the Maple Leaf Adventures office so I have had to experience each job's duties and responsibilities. Is it possible to land this type of job without any direct experience? Experience is always preferable for any recruiter but the right attitude and passion for a job can compensate for a lack of direct experience. The right candidate can be trained. Working on a sailing vessel doing adventure trips to remote BC/Alaska destinations is as much of a lifestyle choice as a job. YES! To be a part of a crew of people working on a classic sailing yacht traveling the most amazing wilderness destinations on the BC/Alaska coast is unlike any opportunity out there. 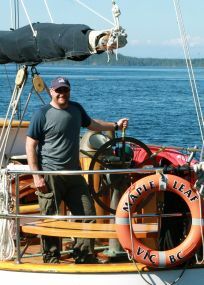 Working on a boat like Maple Leaf fosters personal growth, relationships, and adventure like no other career can. What personal benefits/rewards do you find from working on a yacht? I value the opportunity to meet interesting people, work with excellent crew, and explore amazing destinations. I also love the opportunity to work on such a beautiful and historic vessel. There are many wonderful daily occurrences you look forward to, as well as the unexpected events that make you shake you head and think, "I am getting paid to do this right now!?" Maple Leaf treats the crew with respect and appreciation. The owners are active crewmembers themselves and fully understand the hard work that is put into operating a classic sailing ship and creating the adventures to the remote destinations we do. Crew is expected to work hard but they are rewarded by the opportunity to be involved in every aspect of each voyage including participating in the activities that the guests do. The crew is often thanked after a successful trip with a meal out at the port of call, and a great year-end crew party.